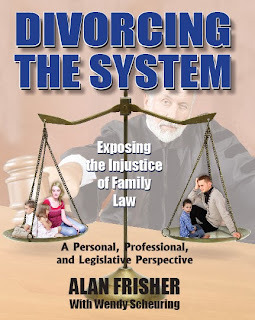 Alan Frisher is a financial advisor, a Certified Divorce Financial Analyst™, and the spokesman and president of Family Law Reform, Inc., a not-for-profit advocacy organization highly influential in State politics surrounding family law. Alan is working to change alimony and other family law in Florida as well as throughout the nation. Alan has published numerous articles, and his efforts regarding alimony reform have been written about by Time Magazine, USA Today, the New York Times, the Wall Street Journal, the Sun Sentinel, Florida Today, the Lakeland Ledger, and many other local publications. He has also been interviewed on Fox 35 TV and the Anderson Cooper Show in New York City. Divorcing the System is available in paperback on SageDivorce.com, and FamilyLawReformUSA.com. It is also available as an Ebook on Amazon.com, Barnes&Nobel.com Vook, and Ibookstore.com. Frisher will be participating in the Meet the Authors' Book Fair on Sunday, November 24, 2013 in the Eau Gallie Civic Center during the ArtWorks Feistival in Melbourne, Florida. Be sure to stop by to see him and to have a look at his book.